That's it, I'm officially on 'No buy in July'. I have spent way, way too much money in the last four weeks on nail polish. Most of my hauls have arrived, I'm just waiting on my Kleancolor metallics. Ozotic Pro holographics 511, 513, 516, 518, 522, 524, 525, 526, 527. Ozotic Pro scattered holographics 600, 601, 602, 603, 604, 605, 606, 607, 608, 609, 617, 619, 621 and 624. So I'm telling you now, you are going to be seeing A LOT of Ozotic Pro swatches coming up. With the exception of 509 (linear Silver holo) I believe I have every multi chrome, every linear holo and every scattered holo in the Ozotic/Artform/Chemistry/B Range - Lumineye range. Once July is over I might just have to get a Chemistry 509 so my list will be complete, although I have so many silver holos I don't really need it, but OCD in me needs it to complete the collection.. Also, once I have all my swatches together I will put together a colour guide. The first polish I tried out of my haul was Ozotic 604. This is a pale champagne gold scattered holographic polish. Spectacular to look at and easy to apply. This was two coats. 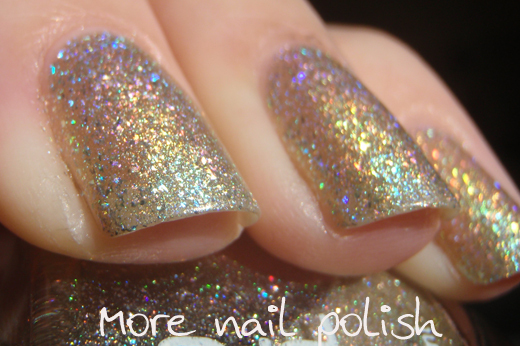 The holo particles look rather chunky, but they are still silky smooth on the nail without top coat and remove easily. So no stupid foil method required for these babies! Now if you have any requests for which Ozotic or Chemistry you would like to see, please let me know, otherwise I'm just gonna be working my way through them. Mmm! I think it's awesome that the holo looks chunky! That makes it different! What's 'the foil method'? Is this some clever way of removing clunky polish? Gorgeous! Looks very similar to 604. Good luck with the no buy - I'm supposed to be on one now too but have already bought 4 polishes - do'oh! Hahaha I just blogged that I'm doing a No Buy July yesterday!! I'm outta control!!! I'm with you on the no buy. I just call it "stash appreciation month" lol. Where do you get these Chemistry ones? I've heard pretty much nothing about them and googling yields nothing. I'm glad someone else thinks Chemistry 507 and 519 are the same as I've been work out the difference aswell. And this polish is gorgeous! Congrats on your AH-mazing hauls! and good luck for your no-buy! How do you buy your chemistrys? I've looked on 'essential beauty' website but I'm not 100% that they sell to the public... and theres no way to say which numbers you want or a decent colour chart. Cant wait to see your swatches! Their ordering system is weird. You have to just add the "Chemistry Various Nail Polishes" to your cart, and then email (or call) them to say what colours you want. When I spoke to them last week they said they were sold out of all 500 series, but were getting more in. I know what you mean about the colour chart, I just picked numbers that I didn't have in my ozotic hauls and hoped for the best. thanks so much! It sounds like the numbers you picked are beautiful so you've done well! I'll have to snap some up! 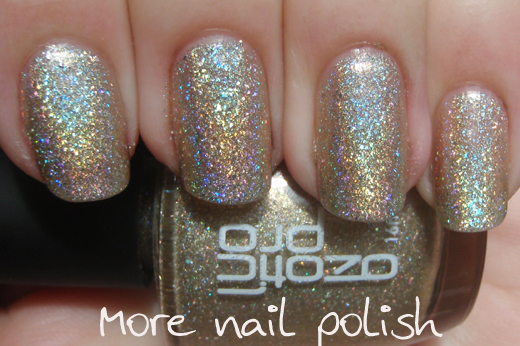 Omg...these Ozotic holos, they are all so pretty!!! Hope you post them all! They are really nice at Essential Distribution - I've been to their warehouse [and it is a warehouse] and drooled over the wall of polishes! Lianne - the foil method is an easier way to remove glitter polishes, involving the use of cotton balls with nail polish remover on them affixed to your finger with small pieces of foil to hold them in place for a few minutes. When you pull them off most of the glitter comes away easily.